“Dream with me. Let’s talk about vision. Let’s talk about spaces.” Remember when the Alliance for the Arts threw a big party for its 40th birthday? That was last year, when Executive Director Lydia Black spoke those words to a packed, enthusiastic house. A vibrant new logo and a “footprint for the future” were unveiled to usher in the next 40 years and beyond. Well, the future starts now! That’s because with a boatload of community support, phase one of the Alliance’s campus enrichment plan is (almost) in full effect. All that’s needed is an additional $50k. 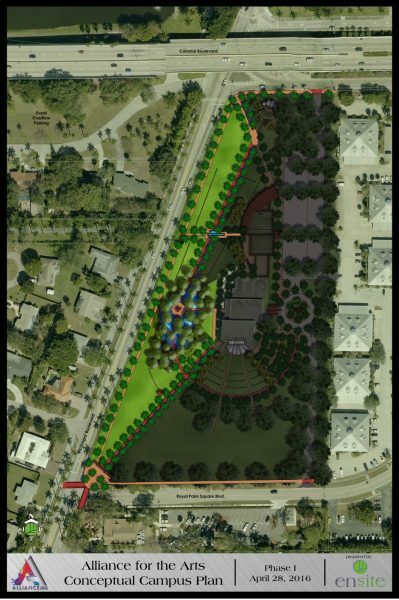 Phase One of the campus enrichment project which focuses on the beautification of 2.2 acres along McGregor Boulevard, transforming the gateway into the City of Fort Myers into a pedestrian-friendly space for the entire community. This phase includes the installation of an eight-foot sidewalk, landscaping, irrigation, gardens, a significant placement/public art project, new signage and pedestrian friendly intersections. EnSite is proud to have participated in the visioning process and produced the conceptual plans for the campus enrichment process. The future is in your hands!